In this post: The ultimate guide to romantic period dramas available to watch on Amazon Prime Video and Netflix. Also includes movies that can be rented on Amazon.com. Watching television is definitely one of my guilty pleasures. It helps me unwind in the evening, and as an empty nester, it helps fill the hours I used to spend with my kids. It sounds dramatic to say that Netflix has changed my life, but in a way, it really has. (Along with a smart TV!) A whole new world of entertainment opened up when I discovered Netflix and Amazon Prime Video. I spend my days running this blog…but when I want to kick back in the evening, I watch TV…and I am never happier than when I am watching romantic period dramas. Finding romantic period dramas on regular cable TV is next to impossible. Not so with the movie channels. There are so many to choose from that I decided to compile this list. It’s not a “complete” list because there will always be additions and deletions. But it’s very extensive and I’ve tried to include as many movies and shows as I could find. I’ve listed the movies and shows according to where they can be viewed. The lists themselves are in no particular order. A few things before we get to the lists. Netflix is also an app that can be viewed on a smart phone, tablet, or smart TV. Click HERE for more information. The first month is free and you can cancel at anytime. Poldark Seasons 1-3 (Season 4 airing on PBS this fall.) Watch the Season 4 trailer HERE. A Place to Call Home Seasons 1-5 (Season 6 begins August 31.) Watch the Season 6 trailer HERE. Netflix is pretty far behind Amazon when it comes to offering romantic period dramas. They do have a few good shows that are definitely worth mentioning. The Guernsey Literary and Potato Peel Pie Society (coming August 10.) Watch the trailer HERE. 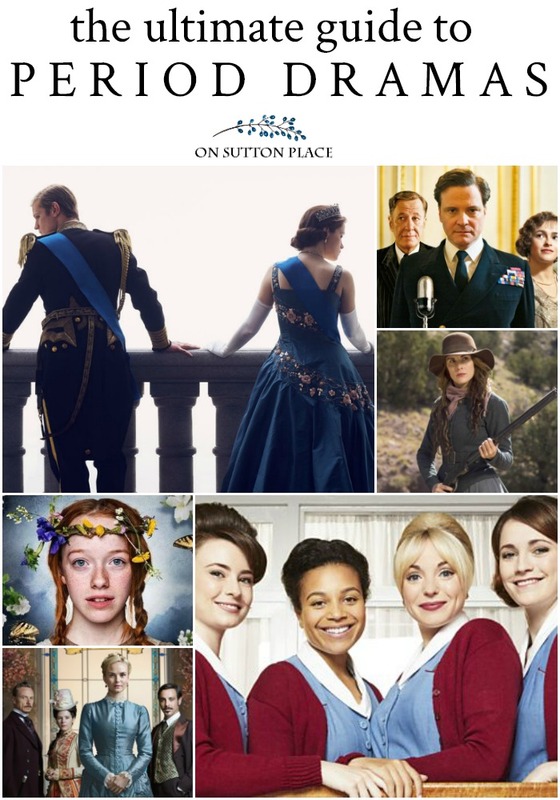 If you are already an OSP email subscriber, you can download a copy of the Romantic Period Dramas list in the Members Only Library. Click HERE. Call The Midwife was an unexpected pleasure – I LOVED all 6 seasons! I watched The Guernsey Literary and Potato Pie Peel Society flick a couple of days ago…. LOVED IT. I especially liked seeing so many “old friends” from Downton Abbey. I don’t watch a lot of TV but with this list in hand I think I’ll start this fall! My baby moves into her dorm next week and then I’ll be an empty nester too! Thanks for sharing such a great list! Great list! I love Masterpiece Theatre and would like to let everyone know that you can stream the latest episodes free from the day they air for about two weeks. If you pay $60/year you can stream a whole library of their productions. You can cast from a Chromecast or be low tech like me and go from laptop to tv with an HDMI cable. Also Bletchley Circle about women code breakers in WWII, not a romance, but so good! Ann, I was going to suggest that we needed a printable copy of your recommendations and BOOM! It was right there! You are amazing and so thoughtful! I too love watching TV especially binge watching period romantic stories! One of my favorites not on your list is on Acorn called Miss Fischer’s Murder Mysteries; set in the 1920’s the costumes are fabulous!!! and with a strong women lead. Enjoy!!! Thank you! We are ‘new’ to the smart tv trend and just learning what is available. This list is wonderful! I’ve printed it and now will have a guide to all the shows I want to watch. Why, thank you, thank you! I believe you have just opened a new door for me. What an amazing list! Thank you, Ann! First, I had not realized you were an empty nester. Me too. I love your blog. Thank you for this favorite list of period dramas. I will enjoy every one. Thanks for this comprehensive list! I downloaded it. I started watching the first season of The Crown based on a post you wrote. Another wonderful PB S story. Love, love, Poldark. There are 3 seasons on Amazon Prime with the 4th one coming to Masterpiece in September. Thank you Ann . For this wonderful list! “” Place to call home”. Is a great soap. Is too bad about Dr Blake , they canceled the show! I hope another Company, picks it up. I’m addictive to good series, can’t stop watching them. I also love all the shows you have listed…my new addition to the list would be in a totally different direction but a fun addition…. Always someone who watched TV only when a documentary or some crime stopper bulletin was airing, I never had much time for period drama, until the last few years. My oh my, I have developed a passion. Our local PBS has always been front forward in jumping onto the genre and of course, Amazon, Netflix and Acorn have only fueled my interest. I totally agree with your listings and there are a few (well quite a few) that I haven’t seen but just finished “A Place to Call Home” last week. I had to watch in bits and spurts most times because of family obligations an our new Puppy, Miss Lola the Wonder Dog. I forgot just how much goes into the first months. Sleep is optional here! Looking forward to seeing more. I will actually print off your lists for future reference, thank you! Thanks Ann. We are winter watchers and thought we were pretty m out of options. This will help. Oh DowntonAbbey how we miss you! Ann, I have been following you for some time and I remember at one time you posted where you purchased your living room coffee table and end tables. I have been searching your post this evening and can’t find the post. Do you remember where they you bought them? Problem with me is I keep reading all these interesting post from before I was a regular reader and you share so much wonderful information that I get absorbed with inspiration. Hello! The tables in our living room were purchased about 30 years ago when we moved into this house. At one point, I found something very similar on a retail website but now the listings are gone. I did another search but could find nothing. I will keep looking and if I find something, I’ll add it to my shop page. Thanks so much for your list. There are a few here that I haven’t run across yet. I just finished Anne (with an E) of Green Gables- I thought it was cute and it was a very loose adaptation-but still and all—good. I LOVE Mr. Selfridge & The Paradise and several others there, too. Hi Diana! Yes…the Anne with an “E” show is an extremely loose adaptation! I agree though, enjoyable to watch. Enjoy the rest of your summer!